As a guest of DelSuites, we want to make your stay in Toronto as easy and enjoyable as possible. 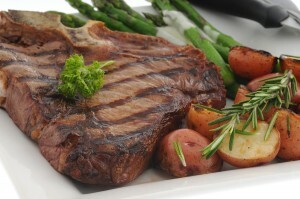 And what better way to do that, than to offer you a great deal on a delicious dinner at The Keg? We have teamed up with Canadian luxury steakhouse The Keg to offer all of our guests 20% off all food at two Toronto locations (North York and Midtown Toronto). That means you can treat yourself to succulent, juicy steak, artisanal cocktails and other great dishes – for less. If you arrive at your DelSuites accommodation feeling hungry, we highly recommend that you make your way down to this restaurant – you’ll get a very warm welcome along with the great discount! If you’re not from Canada and therefore not familiar with The Keg, you’re in for a treat. Founded in 1971 in North Vancouver, this steakhouse chain has 160 locations all over Canada (as well as locations in five American states). They are known for offering an upscale dining experience and are often built within beautiful restored and refurbished historic properties. What can you expect from the food at The Keg? Well, first of all – the steaks are their pride and joy. It’s a popular spot for getting together with friends, celebrating with family members or impressing your sweetheart on a date night. This special offer of 20% off all food at The Keg is available for guests staying at our Midtown or North York locations. 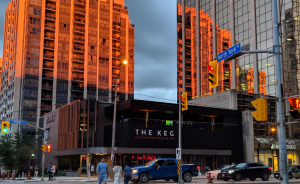 The discount is applicable at the North York or Yonge and Eglinton locations of The Keg – and only for the duration of your stay. It’s a chance for you to discover one of Canada’s favourite restaurants during your visit to Toronto. So, whether it’s an anniversary meal, a celebration of a promotion, a family dinner or a special meal out “just because” – we hope you enjoy The Keg! If you have any questions about this special promotion – feel free to reach out to the DelSuites team. We are happy to help!